It’s that time of year again! Vulnerability databases whip up reports touting statistics and observations based on their last year of collecting data. It’s understandable, especially for a commercial database, to show why your data source is the best. In the past, we haven’t had a strong desire to whip up a flashy PDF with our take on vulnerability disclosure statistics. Instead, we’ve focused more on educating others on why their statistics are often so horribly wrong or misleading. It should come as no surprise then, as we find ourselves forced to point out the errors in Secunia’s ways. We did the same thing last year in a long blog, giving more perspective and our own numbers for balance. After reading this year’s report from Secunia, we could basically use last year’s blog as a template and just plug in new numbers. Instead, it is important to point out that after last year’s review, Secunia opted not to revise their methodology. Worse, they did not take any pointers from a presentation on vulnerability statistics Steve Christey (CVE / MITRE) and I did at BlackHat before last year’s report, pointing out the most common flaws in statistics and where the bias comes from. It is easy to chalk up last year’s report as being naive and not fully appreciating or understanding such statistics. This year though, they have no excuse. The numbers they report seem purposefully misleading and are a disservice to their customers and the community. The headline of their press release and crux of their report is that they identified 15,435 vulnerabilities in 2014. This is entirely inaccurate, and completely misleading. This is fundamentally due to the same very flawed methodology they used last year, where they count a single vulnerability as many as 210 times (e.g. this year CVE-2014-0160, aka Heartbleed). Then factor in all of the other high profile “logo” vulnerabilities (e.g. FREAK, ShellShock), especially in OpenSSL, and the same handful of vulnerabilities will get counted hundreds or even a thousand times. To be abundantly clear, a vulnerability in a third-party library such as OpenSSL is one vulnerability. It doesn’t matter how many other products use and integrate that code, the fundamental flaw is in the library. Counting each product that implements OpenSSL as a distinct vulnerability, rather than a distinct occurrence of a vulnerability, is wrong. Worse, it actually highlights just how poor their statistics are, if you do accept their flawed methodology, as it is heavily used among thousands of applications that Secunia doesn’t cover, even when a vendor like IBM issues numerous advisories that they miss. No matter how you cut it, their numbers are invalid. So poking at our database, understanding we don’t quite have a 100% mapping to Secunia, but feel it is pretty close, we see that around 5,280 of our entries have a Secunia reference and 4,530 of those also have a CVE reference (compared to more than 8,500 entries we have with a CVE reference). Even counting for a good margin of error, it still appears that Secunia does not cover almost 3,000 vulnerabilities in 2014, which are covered by CVE entries. Those familiar with this blog know that we are more critical of CVE than any other Vulnerability Database. If a commercial VDB with hundreds of high-dollar clients can’t even keep a 100% mapping with an over-funded, U.S. government run VDB that is considered the “lowest common denominator” by many, that speaks volumes. I could end the blog on that note alone, because anything less than mediocrity is a disgrace. How do you trust, and pay for, a vulnerability intelligence service missing thousands of publicly disclosed vulnerabilities, that are served up on a platter and available to anyone for free use and inclusion in their own database? You don’t. After all, remember this quote from the Secunia report last year? CVE has become a de facto industry standard used to uniquely identify vulnerabilities, which have achieved wide acceptance in the security industry. All of the above is not only important, it is absolutely critical to appropriately frame their statistics. Not only does Secunia avoid using the minimum industry standard for vulnerability aggregation, they opt to use their own methodology, which they now know beyond doubt seriously inflates their ‘vulnerability’ count. Last year, it was by almost three times more than reality. This year, it was also by about three times more than reality, as they only covered approximately 5,500 unique vulnerabilities. That is almost 3,000 less than CVE and 8,000 less than OSVDB. Any excuses of Secunia coverage lacking that are based on them claiming to verify vulnerabilities and “not covering vulnerabilities in beta software” are also invalid, as a majority of vulnerabilities reported are in stable software, and regularly come from trusted researchers or the vendors themselves. Regardless, it should be clear to anyone passingly familiar with the aggregation of vulnerabilities that Secunia is playing well outside the bounds of reality. Of course, every provider of vulnerability intelligence has some motive, or at least desire, to see the numbers go up year to year. It further justifies their customers spending money on the solution. “Every year, we see an increase in the number of vulnerabilities discovered, emphasizing the need for organizations to stay on top of their environment. IT teams need to have complete visibility of the applications that are in use, and they need firm policies and procedures in place, in order to deal with the vulnerabilities as they are disclosed.” — Kasper Lindgaard, Director of Research and Security at Secunia. While Mr. Lindgaard’s quote is flashy and compelling, it is also completely wrong, even according to their own historical reports. If Mr. Lindgaard had read Secunia’s own report from 2010 and 2011, he might have avoided this blunder. With highly questionable statistics, based on a flawed methodology, Secunia also lucked out this year, as vendors are more prudent about reporting vulnerabilities in used third-party libraries (e.g. OpenSSL, PHP). This plays out nicely for a company that incorrectly counts each vendor’s use of vulnerable software as a distinct issue. Getting down to the statistics they share, we’ll give a few additional perspectives. As with all vulnerability statistics, they should be properly explained and disclaimed, or they are essentially meaningless. As stated previously, this is absolutely false. Rather than track unique vulnerabilities, Secunia’s model and methodology is to focus more on products and operating systems. For example, they will issue one advisory for a vulnerability in OpenSSL, then dozens of additional advisories for the exact same vulnerability. The only difference is that each subsequent advisory covers a product or operating system that uses it. Above I mentioned the redundant ‘HeartBleed’ entries, but to further illustrate the point and demonstrate how this practice can lead to wildly inaccurate statistics, let’s examine the OpenSSL ‘FREAK’ vulnerability as well (29 Secunia advisories). The flaw is in the OpenSSL code, not the implementation from each vendor, so it is still that same one vulnerability. Depending on how good their coverage is, this could be more problematic. Looking at IBM, who uses OpenSSL in a wide variety of their products, we know that at least 56 are impacted by the vulnerability, which may mean that many more Secunia advisories cover them. If we had a perfect glimpse into what products use OpenSSL, it would likely be thousands. Trying to suggest that is ‘thousands of unique vulnerabilities’ is simply ignorant. We assume that by ‘patches’, they mean a viable vendor-provided solution (e.g. upgrade) as well. Based on our aggregation, it is closer to 64% that have a solution available, and that is not counting “the day of disclosure”. That includes vendors who have patched since the issue was disclosed. 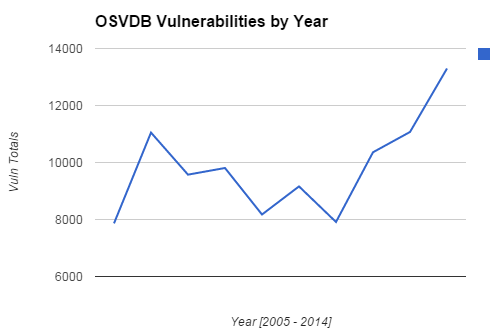 This big gap comes from the number of vulnerabilities aggregated by each database since the start of 2014. Assuming we use the same definition of “zero-day” as Secunia, this is considerably under what we tracked. We flag such issues “discovered in the wild”, meaning the vulnerability was being actively exploited by attackers when it was discovered and/or disclosed. In 2014, we show 43 entries with this designation, compared to 73 in 2013. That is a sharp decrease, not increase. Part of that large swing for us comes from a rash of attacker-trojaned software distributions that were used to target mobile users in 2013. Since trojaned software from a legitimate vendor meets the criteria to be called a vulnerability (it can be abused by a bad actor to cross privilege boundaries), we include it where Secunia and other databases generally ignore it. Since we got into the “popular products” bit in last year’s rebuttal to their statistics, we’ll skip that this year. However, in 2014 we show that 16 of those “zero day” were in Microsoft products (two in Windows, six in the bundled MSIE), and four were in Adobe products. Without searching our data, it is likely very safe to say these numbers are way off, and that Secunia’s coverage of browser security is woefully behind. In addition to not aggregating as much data, they likely don’t properly take into account vulnerabilities in WebKit, which potentially affects Chrome, Safari, and Opera. Are WebKit vulnerabilities attributed to one, the other, or all three? With that in mind, let’s compare numbers. We see ~200 for Mozilla, ~250 for Microsoft IE, and not even 10 between Safari and Opera. In reality, Opera is not forthcoming in their information about vulnerabilities they patch, so their actual vulnerability count is likely much higher. That leaves us with Chrome, which had over 300 vulnerabilities in their own code. As mentioned, factor in another 100+ vulnerabilities in WebKit that may impact up to three browsers. That comes to a total of 889, far less than their claimed 1,035. That makes us curious if they are using the same flawed methodology with browser vulnerabilities, as they do with libraries (i.e. counting WebKit / Blink issues multiple times for each browser using it). Some vulnerabilities in these browsers are also due to flaws in other 3rd party libraries and not in the browsers’ own code (e.g. ICU4C and OpenJPEG). Finally, Google Chrome provides Adobe Flash Player, so is Secunia adding the number of vulnerabilities addressed in Flash Player to their Google Chrome count as well, further bloating it? So many unknowns and another reminder of why vulnerability statistics are often misleading or serve no value. Without explaining the methodology, we’re left with guesses and assumptions that strongly suggest this statistic can’t be trusted. Google releases details about the vulnerabilities fixed in Chrome, unlike some other browser vendors. For example, Opera releases almost no information. Microsoft typically releases information on the more serious vulnerabilities, and none from their internal auditing. Of the 310 Chrome vulnerabilities we tracked, 66 were CVSSv2 5.0 or less. Google has perhaps the most aggressive bug bounty program in the industry, which encourages more researchers to audit their code. How aggressive? They paid out more than US$550,000 in 2014, just for Chrome vulnerabilities. Google’s turnaround in fixing Chrome vulnerabilities is quite respectable. Since many of the vulnerabilities were reported to them and fixed promptly, it is easy to argue with the claim it is the “least secure” browser. Google fields several teams of security experts that audit their code, including Chrome. They find and fix potential issues before disclosing them. By doing that, they are ensuring the security of the browser, yet effectively getting punished by Secunia for doing so. In addition to all of the issues disclosed, a tiny fraction were actually proven to be exploitable. Like many software vendors, they find it is easier and more efficient to spend a small amount of time to fix the possible vulnerability rather than the larger amount of time required to prove it is exploitable. There are many pitfalls of using simple disclosed vulnerability totals to compare products. This is explained over and over by those familiar with the vulnerability disclosure world, and should be common knowledge to ‘experts’ in vulnerability research. Instead, Secunia not only fuels media articles that aren’t critical of their report, they Tweet little snippets without any context. They also have their partners repeat their statistics, giving them more exposure, misleading the customers of other companies. Vulnerability statistics can be useful. But they must be presented in a responsible and educated manner to serve their purpose. Those not familiar with vulnerability aggregation and generating the resulting statistics typically do a poor job, and add confusion to the matter. We like to call such people “vulnerability tourists”, and we can now add Secunia to the growing list of them. One of the aspects that I find interesting in the Secunia VIM service is the directly related to how they track vulnerabilities. That is the “applicability” aspect of the vulnerability. Many customers do not have a strong grasp on vulnerabilities and knowing that OpenSSL is vulnerable does not help them with their security operations. They NEED to know that their applications use OpenSSL. While I do not advocate the way that Secunia inflates their value, they do not provide a service that a simple vulnerability database does not. This is particularly valuable for industries that shy away from security as much as possible and only want to satisfy auditors. As to whether their service is valuable for customers who need “applicability” information, that depends on coverage. If they are missing publicly disclosed vulnerabilities that have existing patches, then their customers will need to cross-reference with the CVE to ensure coverage and do their own applicability analysis. Someone needs to provide a well-rounded applicability service that matches applications and assets against vulnerability information.